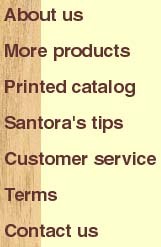 Click Here for more products not listed in the Printed Catalog. For general cleaning in motels, hotels, schools Institutions and industrial plants. This product should always be diluted with water before using as in its concentrated form it may cause and irritation to the skin. A highly concentrated, commercial type ammoniated stripper specifically formulated for removal of water emulsion finishes of metal cross link copolymers and other water emulsion finishes from composition floors or other hard surfaces NOT HARMED BY WATER. 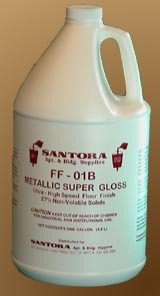 This brilliant gloss, high solid floor finish is for use on vinyl, linoleum and asphalt tile floors. 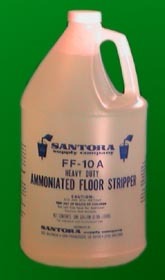 Also used on hard surface flooring, terrazo, ceramic tile and sealed hard wood floors. The metal interlock chemistry of this product gives detergent resistance to the floor finish and cannot be removed by ordinary detergents. Finish can be unlocked and removed with the ammoniated stripping solutions. 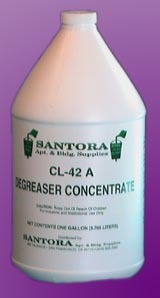 A general purpose concentrated cleaner formulated for cleaning floors, walls and painted surfaces. 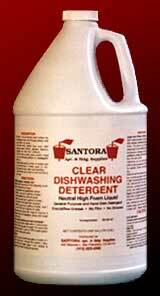 This cleaner is formulated with a triple action detergent system. Removes oil, grease and grime with ease. Low suds action for use in power scrubbers. Can be used in hard or soft water and with cold water for greater savings. 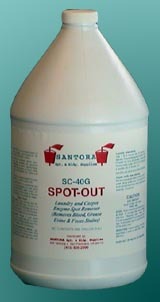 Spot-Out is a synergized blend of threebacillus microorganisms for optimum enzymatic activity. It produces protease, lipase, amylase and cellulase for excellent breakdown of starch, carbohydrate, protein, fats, grease, lipstick, ink, coffee and tea. Use Spot-Out in commercial and home type laundries. It is also good for cleaning floors, walls, toilets, urinals, sinks, and all types of fixtures and surfaces not harmed by water. 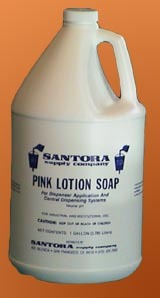 A fine lotionized hand cleaner, formulated with skin softeners and moisturizers and an exquisite floral perfume. For those who desire excellence. Leaves hands feeling soft and smooth. CLEAR is a top-of-the-line hard surface liquid detergent that cuts through many greasy soils yet is mild to the hands. It provides thick, stable, foam even after cleaning greasy dishes, glasses, flatware, counters, and other hard surfaces. CLEAR is safe on paint, glass, plastic, metal or on any washable surface. It's biodegradable too. PROTEC SHEEN is a nonsolvent protectant that cleans, shines and revitalizes marble counter tops, formica, rubber and vinyl in one step. 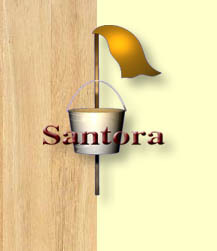 It restores the natural oils and shine that chemicals and weathering remove. 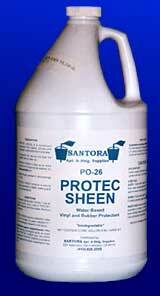 PROTEC SHEEN is ideal for restoring all counter tops. DO NOT USE ON ANY FLOOR, AS IT WILL BE SLIPPERY. PROTEC SHEEN contains a natural citrus degreaser for better cleaning and a pleasant smell. ALL PURPOSE SPOTTER is a ready-to-use carpet spot remover. It removes alcohol, beer, blood, catsup, chocolate, coffee, clay, cologne, copy machine toner, egg, excrement, food stains, latex paint, mildew, mud, tobacco, urine, vomit, water stains and wine. 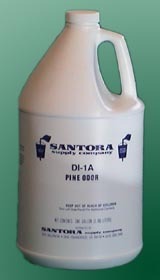 It's formulated to work on fabric, upholstery, natural and 5th generation carpet fibers. Not recommended for wool carpets, leather, satin, silk, suede, velvet, or any fabric that can be damaged by water. 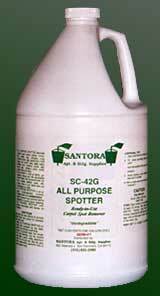 ALL PURPOSE SPOTTER is all organice, nonphosphated, nontoxic, nonflammable and biodegrable. 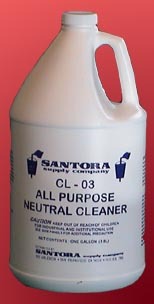 A low-foam alkaline cleaner for use in automatic floor scrub machines. 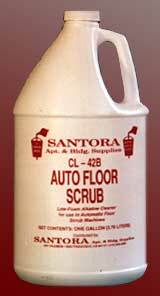 AUTO FLOOR SCRUB contains low foam surfactants, degreasers, builder and water conditioning agents that cut through and dissolve grease, tire marks and other soils common to dirty floors. AUTO FLOOR SCRUB also contains a defoamer that endures fast, efficient floor machine cleaning.